These SKIPPY® Peanut butter & Jelly Sandwich Cookies are absolutely delicious. A perfect treat for all the family! 1. Preheat the oven to 175°C/155°C Fan/Gas mark 4. 2. Add the butter and both sugars to a stand mixer and mix until light and fluffy, about 3 minutes. Now add the peanut butter and mix for 1-2 minutes. 3. Add the egg and vanilla extract, mix until fully combined. 4. In a small bowl combine the flour, salt and bicarbonate of soda. Now add to the mixer and mix on a low speed for less than a minute. 5. Divide the cookie dough into 16 cookies and place on a baking tray. Bake in the oven for 10 minutes until lightly golden and firm on the edges. 6. Meanwhile make the buttercream; cream the butter and peanut butter in your mixer until smooth and creamy 2-3 minutes. Now add the icing sugar and cream, set aside. 7. Remove the cookies from the oven and set aside for 3-4 minutes. Transfer to a cooling rack until completely cooled. 8. Once cool frost half of the cookies with the peanut butter buttercream, spread the jam onto the other cookies. 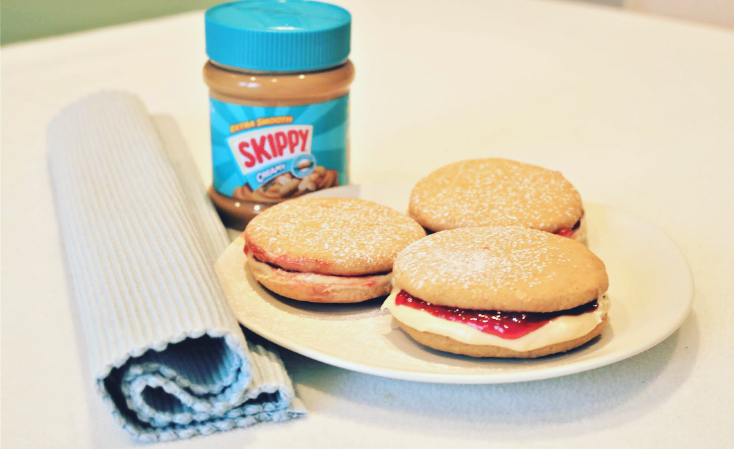 Sandwich the jam and peanut butter cookies together. Enjoy! Craving a peanutty taste that packs a crunch? Look no further than SKIPPY® EXTRA CRUNCHY® Peanut Butter. 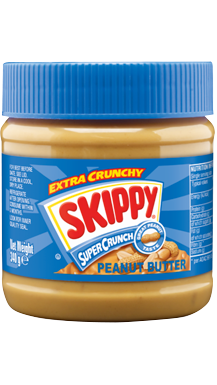 Every jar is blended with loads of real peanut pieces, so you get the fun flavour of SKIPPY® Peanut Butter, plus lots of crunchiness. Spread on the smiles with smooth, creamy, melt in the mouth peanut butter perfection. 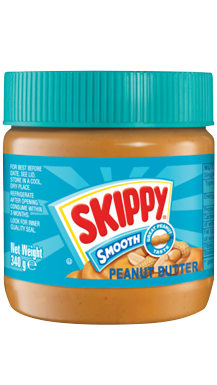 SKIPPY® Smooth Peanut Butter adds more yum and fun to just about anything. It ain’t nothing but smooth snacking with this creamy classic.